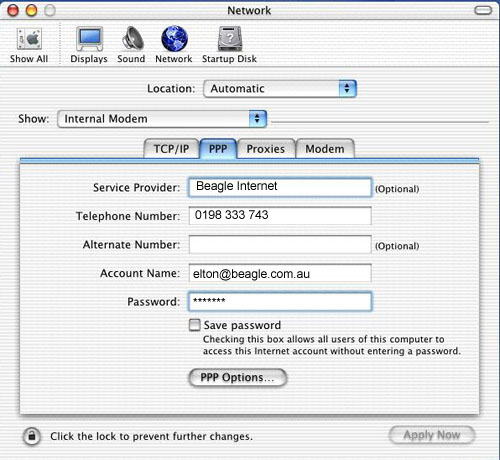 The following setup guide shows the steps required to get on the Internet with Beagle and your Mac OS X computer. Please note that this setup guide was produced with a computer running Mac OS X 10.1. The screens may vary slightly in newer versions of Mac OS but the process and principles are the same. Make sure the device in the configure drop down box is Using PPP and that all the preferences are blank. If there are any settings present, remove them and click Apply. Now click the PPP tab at the top of the menu. You will see the following screen. Ensure that the show setting displays your modem name (for example Internal Modem). In the Service Provider field enter Beagle Internet and in the Telephone Number field enter the Beagle dial-up phone number - 0198 333 743. Enter your username@beagle.com.au in the Account Name field and your password in the Password field. Please note, it is critical that you place the @beagle.com.au on the end of your username otherwise you will not be able to log in. Click Apply and then close the System Prefs window. You have now configured your Mac to dialup to the Internet!